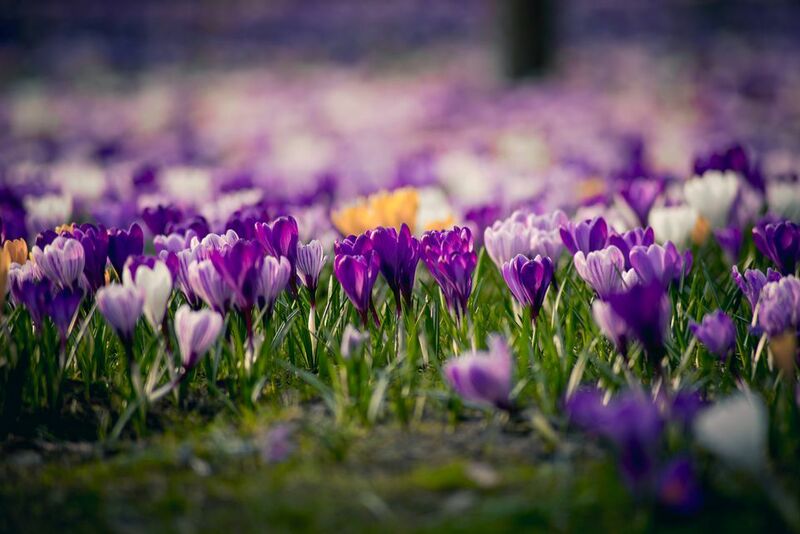 While some gardeners mark the vernal equinox on their calendar as a sort of unofficial start to the flower gardening season, those who plant their favorite crocus varieties are rewarded a two full months earlier than that. Short on stature but big on charm, crocus flowers require little more than an undisturbed space in the landscape where they can gradually multiply into handsome colonies. Gardeners have been enjoying this pale lavender heirloom since 1847. In the early morning light, petals appear almost silvery, giving the flowers a luminous effect. Also known affectionately as "Tommies" Crocus tommasinianus is resistant to squirrels. As pert as a swatch of seersucker cloth, the 1925 heirloom 'Pickwick' crocus is perfect for forcing in pots so you can admire the delicate stripes up close. 'Pickwick' is considered to be one of the giant spring crocuses, blooming in early April when the first daffodils bloom. The crisp white flowers of 'Jeanne D'Arc" look their best when naturalized in a lawn. Crocus flowers planted in lawns fare best in lawns that do not receive heavy summer irrigation, as they prefer to be on the dry side during dormancy. 'Skyline' has striated petals that resemble 'Pickwick,' only with a blue rather than purple tinge. This crocus is not always available in the trade, but you may find it at online specialty nurseries and garden swaps. An early blooming Crocus chrysanthus, 'Romance' is the perfect shade of butter yellow, without a hint of orange. 'Romance' is a petite variety, no more than two to three inches in height, and looks best when planted in groups of 25 or more. For easy installation, dig a hole with your spade about three inches deep, and plant several together about three inches apart for a natural look. Zenith can mean the peak or a point in the sky above an observer. Does 'Zenith' refer to the ethereal blue of this crocus, or to the fact that it thrives in alpine climates? Either way, gardeners will agree that this recent Dutch introduction is a worthy addition to the spring garden. The shy violet 'Grand Maitre' giant crocus blooms a bit later than many other species, allowing you to stagger and extend bloom times. On sunny days, the petals of 'Grand Maitre' open very wide, revealing the attractive contrasting orange stamens within. 'Grand Maitre' corms will multiply in lawns if you leave the foliage until it withers, which usually happens about six weeks after flowering. Unusual in the crocus world is the reddish color on the petals of 'Zwanenburg Bronze,' an early blooming variety. This crocus is more fragrant than most, so try it in raised beds or containers to bring the scent closer. Can't decide whether to choose a yellow crocus or a purple variety? Get both hues in the perky 'Firefly' cultivar. This Mediterranean native appreciates the sharp drainage of rock gardens, and may not perennialize in areas with clay soils. 'Gipsy Girl' is the yellow crocus complement to 'Pickwick' and 'Skyline.' The first bees of spring will seek out these golden beacons in your garden. As a snow crocus, 'Advance' is one of the earliest bloomers you'll find. By late spring plants are dormant, making it an ideal variety to plant in lawns. Plant in sunny areas, as flowers will stay closed in shady areas, as well as on cloudy days. No one ever tires of the classic appeal of white flowers, but sometimes a white crocus can disappear against a background of snow. 'Ard Schenk' solves that problem with a cheerful golden heart and orange anthers. At the intersection of snow white and lemon yellow lies 'Cream Beauty.' This variety is a recipient of the Royal Horticultural Society's Award of Garden Merit, meaning it has proven itself to be a reliable performer in the garden.